Another exhilarating day of poker has wrapped at the 2018 Battle of Malta and just 60 proud poker players remain. Awaiting them tomorrow? The final 9 seats at the BoM final table where one player will walk away with €300,000. You read that right. The winner of a €550 buy-in tourney will pocket €300,000. Ain’t that grand? 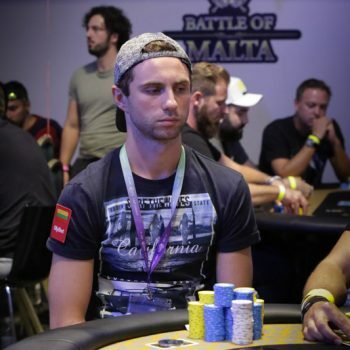 The 2018 Battle of Malta winner will receive the biggest payout ever in a tournament of this buy-in level in Europe. With a huge surge at the end of the day Mantas Urbonas, who started the day with just 117,000 in chips, has soared into the chip lead and will take nearly 7m in chips into Day 3 tomorrow. Other notables still in the field include the final 2 ladies, Sofia Lövgren (1.27m) and Ina Pavlova (1.29m). 888poker pro Lövgren has been a BoM regular for years but this is by far her deepest run. Pavlova made a deep run two years ago and finished 73rd. Another BoM returnee, Flavio Cammasuli (2.36m) will join them on Day 3. He finished 6th in the 2016 Battle of Malta Main Event and now has a top 10 chip stack heading into tomorrow. Brit Andy Hills (5.26m) is another notable stack heading into Day 3 with more than 5m in front of him. Action resumes tomorrow at 1 pm local time and will continue until the final 9 is set. Check the live updates for the action or watch the live stream (on 30-minute delay) on the Battle of Malta Facebook page.